Cherry-picking the best stocks out of popular income ETFs, Tim Plaehn created a new portfolio that trounces its fund counterparts over the last five years. Use this model portfolio to boost your dividend payments and stock performance. 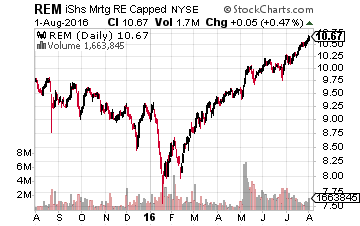 I know a lot of income investors own shares of the iShares Mortgage Real Estate Capped ETF (NYSE: REM) as a stock market investment that pays a high (10%+) current dividend yield. The problem with REM is that it holds a lot of the highly leveraged, dangerous to your wealth, residential mortgage-backed securities, or as they are regularly referred to – MBS REITs. The REM share price has been in a year-long downward trend, barely offset by the dividends for a small positive return. A better option for the high-income focused investor is to build a portfolio from the financially strongest stocks out of the REM holdings list. According to the tax rules that govern their operation, a REIT can own real estate property or participate in the financing of real estate assets. REITs that focus on owning real estate are referred to as equity REITs, while those that focus on the mortgage side of real estate are called finance REITs. The finance REIT side of the REIT universe typically carries much higher dividend yields, which are very attractive to income-focused investors. For comparison, REM currently yields 10.7%, and the largest equity REIT ETF, the Vanguard REIT Index Fund (NYSE: VNQ), yields 3.8%. However, a significant number of finance REITs employ a business model that involves owning government agency guaranteed MBS and leveraging their MBS portfolios to turn the 3% bond yields paid by these safe MBS into the cash flow to pay a double-digit dividend yield. Changing interest rates at either the short or long end of the yield curve will eat into one of these company’s cash flow generation ability. If you look at their histories, most are now paying dividends that are much lower than just a few years ago. For example, just last week one of the larger and more popular agency MBS REITs, American Capital Agency Corp. (NASDAQ: AGNC) reduced its dividend by 10%. The new rate is just 43% the size of the dividend AGNC investors were earning in 2012. As a fund that owns a portfolio of 40 different finance REITs, the REM dividend has shrunk by an average 4.1% per year over the last five years. The result is a share price that has also dropped, leaving an average annual return of 5.5%, even though the dividend yield was well above 10% for the entire period. Factor in taxes and the iShares website reports an annual return for REM of 0.97%. 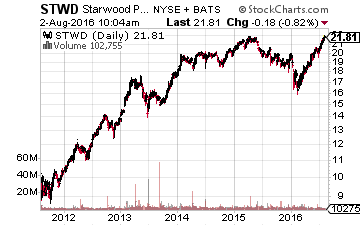 Starwood Property Trust, Inc. (NYSE: STWD) is a commercial mortgage lender. Its five-year average annual return is 13.8% and STWD currently yields 8.7%. Chimera Investment Corporation (NYSE: CIM) primarily owns non-investment grade MBS and has not reduced its dividend since early 2012. The stock has produced an average annual return of 14.1% over the last five years and CIM currently yields 11.3%. 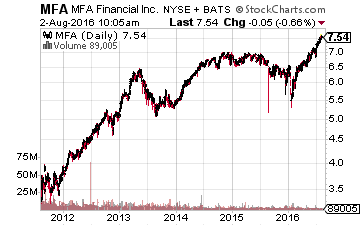 MFA Financial, Inc. (NYSE: MFA) owns a diversified portfolio of mortgage securities. The MFA dividend has been fairly stable over the last five years and has not changed for the last three years. The stock has returned an average 12.3% annually to investors over the last five years. MFA yields 10.5%. PennyMac Mortgage Investment Trust (NYSE: PMT) focuses on originating new mortgages rather than just owning agency MBS. The stock has returned 11.3% to investors over the last five years. PMT currently yields 11.5%. Apollo Commercial Real Est. Finance Inc. (NYSE: ARI) makes commercial mortgage loans and invests in other commercial property debt securities. The company has been increasing its dividend over the last few years and investors have earned an average 10.6% per year over the last five. ARI currently yields 11.3%. 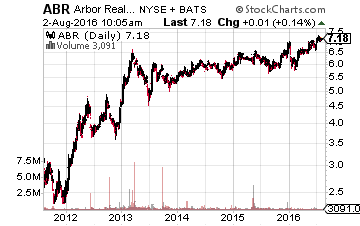 Arbor Realty Trust Inc. (NYSE: ABR) invests in a diversified portfolio of structured finance assets in the multifamily and commercial real estate markets. This stock has returned an average 16.3% per year to investors over the last five years. ABR currently yields 8.3%. Out of the 40 stocks owned by the REM ETF, that is what I found. Six that solid five-year returns and no significant reduction in their dividends. With this group, you would have earned more than double the REM total return. 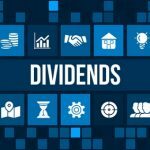 More importantly, these give a much higher level of safety to dividend payments going forward. As you can see, taking the time to do a deep dive on this ETF allowed me to cherry pick the top components that, if owned separately, would have far outpaced the returns of the whole ETF. This type of research into high-yield income stocks has become a specialty of mine, and I make it a habit of only hunting down and recommending the most stable companies that regularly increase their dividends. This is the strategy that I use most often to produce superior results, no matter if the market moves up or down in the shorter term. The combination of a high yield and regular dividend growth is what has given me the most consistent gains out of any strategy that I have tried over my decades-long investing career.